The 2015 release of Kilchoman's Loch Gorm has been announced. This third release consists of whisky distilled in 2009 and 2010 and matured in a mix of Oloroso sherry butts and smaller Oloroso hogsheads. These casks should give the whisky more intense flavours due to the contact between the wood and the whisky. Nose: Soft, spicy and rich with some light smoke, dark chocolate and citrus. Taste: Soft fruit and peat smoke. Finish: Rich and sweet with persisting smoke. Like the 2014 release this edition will be limited to 10.000 bottles. Loch Gorm 2015 is being bottled as we speak and will be released on Monday 23rd or March at 10am - RRP £63.00. 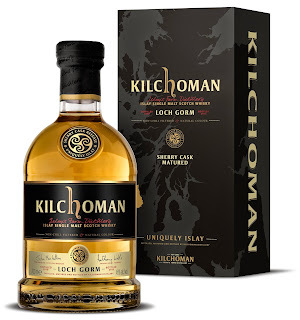 Whisky Review Kilchoman Loch Gorm 2014 "Bicycle repairer in the E.R. after a mud fight"